The Israel Defense Forces are preparing for a possible ground incursion into the Gaza border as they began on early Sunday mobilizing tanks and reinforcing ground troops nearby. Defense Minister Ehud Barak said he would not rule out widening the offensive in the Gaza Strip to include a ground invasion, Sky News reported. Israeli television said on Sunday that the army had begun concentrating ground forces near the tiny Palestinian enclave, rejecting calls by the United Nations and the European Union for a truce after Israel Air Force strikes killed at least 230 people in Gaza. "For us to be asked to have a cease-fire with Hamas is like asking you to have a cease-fire with Al-Qaida," Barak said in an interview with Fox News. "It's something we cannot really accept." Asked whether Israel would follow up the air strikes with a ground offensive, Barak said, "If boots on the ground will be needed, they will be there." "Our intention is to totally change the rules of the game," he said. Prime Minister Ehud Olmert earlier on Saturday said no country in the world would put up with the rocket and missile strikes Israel suffers from and that the time had come to react. Olmert's words came during a press conference he held hours after the Israel Defense Forces and the IAF carried out attacks in Gaza that Palestinian officials said left at least 230 dead and hundreds wounded. Foreign Minister Tzipi Livni on Saturday addressed the ongoing IDF campaign in Gaza, saying, "Until now we have shown restraint. But today there is no other option than a military operation." 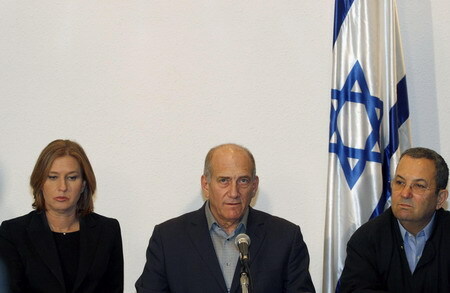 Livni, speaking in English at a press conference, said Israel had no choice but to act to "protect our citizens from attack through a military response against the terror infrastructure in Gaza."